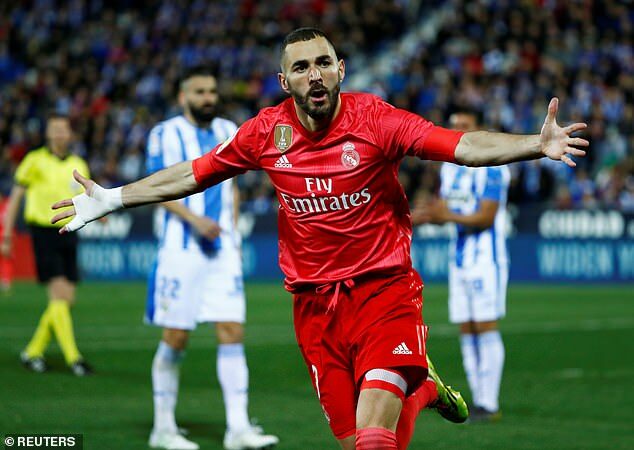 Karim Benzema scored his 18th league goal of the season, his seventh in his last six games, to earn a point for Real Madrid away at modest capital club Leganes. The two dropped points leave them 13 points behind leaders Barcelona. It could have been worse without their number nine who hasn’t stopped scoring since Zinedine Zidane took over. Gareth Bale continues to have fewer reasons to be cheerful under the new coach – he was left on the bench until the last 10 minutes. Leganes took the lead with the last kick of the first half. Middlesbrough loanee Martin Braithwaite laid the ball off to the edge of the area and Jonathan Silva opened his body and side-footed a cute finish into the far corner past Keylor Navas. Braithwaite had missed Leganes’ best previous chance when he headed wide from the edge of the six-yard box on 10 minutes. The Danish striker had scored against Real Madrid earlier in the season in a 1-0 home win that counted for little in a two-legged cup match that Madrid won. Victory this time would mean a lot more – free Leganes shirts for fans for one thing. Supporters had been promised, by the club, that anyone buying a shirt in the build-up to the game would be given their money back if the team won this match. It was a flat first half for Real Madrid. So much so that attention turned to the bench midway through the first 45 when Bale climbed off it and disappeared down the tunnel, presumably to use Leganes’ toilet facilities. He didn’t miss much from the visitors and there was not much more to see when he returned. Isco ran into Unai Bustinza on the edge of the area just before the break and curled his free-kick over the bar. Raphael Varane then went closer still with a shot from an Isco corner that was well saved by Pichu Cuellar. When Silva found the net on 45 minutes Madrid were facing their tenth defeat of the season but Benzema put them back on level terms just six minutes after the break. 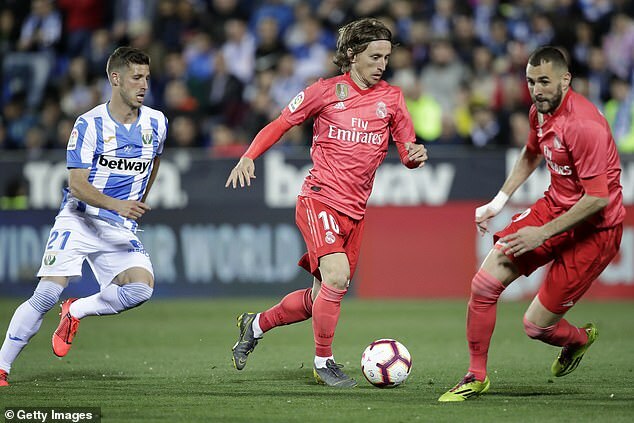 Modric worked his magic in midfield spinning away from Leganes defender Dimitrios Siovas before threading a pass through to Benzema. His first shot was saved by Cuellar but the keeper only managed to push the ball back out to the Frenchman and he made no mistake from the rebound. Madrid’s last five goals had now all come from him. 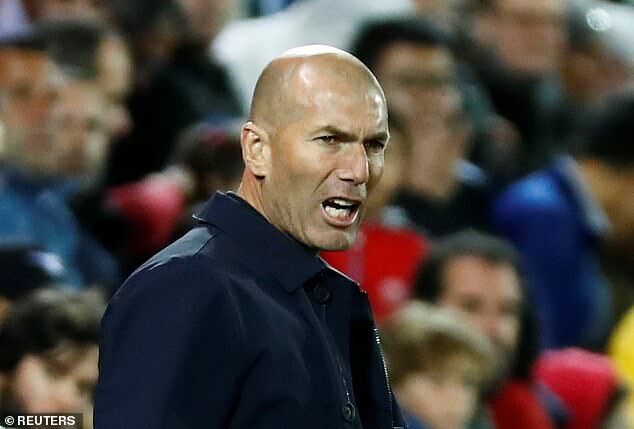 Madrid were now completely on top but still without a second goal with 15 minutes left when Zinedine Zidane turned to his bench. It was Lucas Vazquez who was put on for Isco. 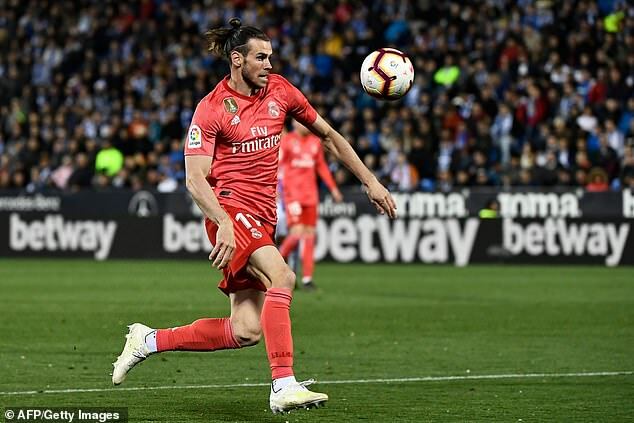 Bale had to continue warming up along the narrow touchline at Butarque. With 10 minutes left he was finally brought on and was at the start of the move that so nearly put Madrid in front. His passed was nudged on by Lucas to Benzema. The Frenchman flicked the ball to Marcelo and he hammered it on to the post. That was their last big chance. At the other end Youssef En-Nesyri twice went close. First he mistimed his run onto a through-ball and so was flagged offside as he dispatched it past Navas. Then he got in behind Varane in another breakaway but allowed the defender to recover and block his shot. Both sides had to settle for just a point. For Leganes it felt historic, for Madrid it felt like another measure of how far they have fallen this season. The day before Barcelona play a Champions League quarter-final they had failed to win in La Liga once again.